Sometimes, you just crave pancakes. At least I do! However I don't always want the "side effects" of the more traditional glutinous, sugary pancakes (delicious as they may be). 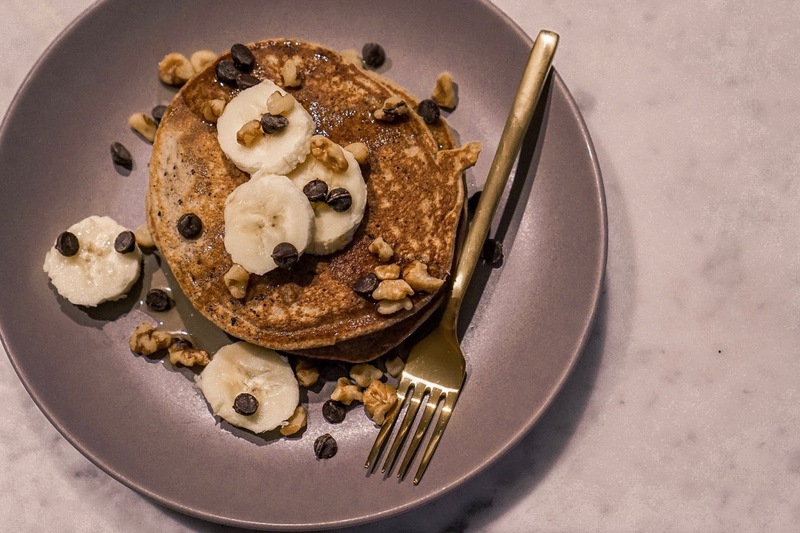 Luckily there so many easy, healthy alternatives, you can have your pancake and eat it too! Without feeling like you need to go back to bed after breakfast. This super simple recipe is made completely in the blender, meaning less fuss and less clean up! There are no refined sugars, flours or oils, only whole foods that will keep you full and energized all morning. I added walnut pieces and my new favorite stevia sweetened chocolate chips, but you can customize the recipe by adding in whatever toppings sound delicious to you (or you have on hand). I promise, they're so easy you'll be making them all the time! Place all ingredients in your blender and blend until smooth. Heat a green non-stick pan or griddle on medium/medium-low (depending on how hot your burner runs). Pour batter (about 1/3 cup per pancake) onto the hot pan, cook for 2 minutes, adding any desired toppings at this point. Flip and cook for another 2 minutes. The trveller always wants to capture all the moments which they feel during they are travelling. Therefore,they always capture the beautiful pictures at https://www.shimlapacks.in/shimla-honeymoon-tour-packages-jammu of the beautiful places. They can also write all the experiences which they get during the travel in their diary.